Hey Guys! Long time no see. Sorry I haven't had a post up in a while, me and Blogger fell out, as you are all well aware by now, technology and I do not get on at the best of times.Thank god a simple update means I am up and running again and excited to bring you regular posts again. So as you can see from the title, I had the pleasure of interviewing the amazingly talented Maeve Reekie. I also was lucky enough to get my makeup done by Maeve so I could do a review for you guys. Maeve is a 17 year old MUA from my hometown Dumfries. From the minute I came across Maeve on social media I was blown away by her talent, even more so when I found out she was only 17 years old. 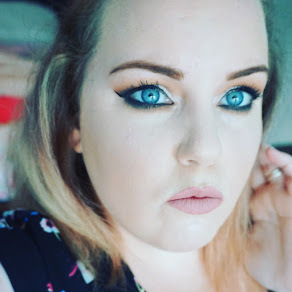 What I feel makes Maeve stand out from many other MUA's is the fact she uses mostly drugstore products. (which she discusses in the interview below). Many people believe you have to spend a fortune on high end makeup products to get the best results but Maeve shows this is not the case and in actual fact the drugstore has many hidden gems. There is also nothing more frustrating than getting your makeup done by a professional and feeling amazing but you can not afford to buy the products they used on you. If you get your makeup done by Maeve you can pop along to the local drugstore and pick up the products she used to recreate the look yourself. I think that is amazing! I don't know about you guys, but I feel really uncomfortable when I am getting any sort of beauty treatment with someone new. Thankfully the minute I met Maeve she made me feel completely at ease. She is a friendly, chatty girl. She makes conversation flow easily and is constantly checking you are comfortable and happy with the look she is creating. Maeve asked me what sort of look I wanted but I told her to do whatever she wanted. As you can see from the photographs below she done a brilliant job. She used eyeshadow shades that I always gravitate towards because they compliment my blue eyes. My brows looked the best they have ever looked and I swear it only took her a matter of minutes to do them, she is a brow genius. My skin looked totally flawless (which i can tell you, it is not! I have not been looking after it the way I should!) Overall, I loved the Makeup and is lasted really well. If you have a night out or an event coming up I highly recommend booking Maeve to do your makeup. Details on how to contact her are at the end of the post. Who are your main influences when it comes to Makeup? I absolutely love Lucy Fitz. When I started doing makeup, she was the first girl I found that was the same age as me at the time and doing makeup on clients. I am so inspired by her hard work ethic and passion for makeup, she's definitely one of my favourites. Through her I discovered others such as KeilidhMua & StacyMarieMua What inspired you to start a career as an mua? If I'm honest, it happened unintentionally. I knew that I had a massive passion for makeup and that I wanted to share my work with others, so I created my page to do exactly that. People started messaging me asking for appointments and it just took off from there! I can't imagine not doing it now, I love it so much. What YouTubers/Beauty Influencers do you watch? If any? I love to watch Jamie Genevieve, NikkieTutorials, SophDoesNails, PixiWoo, Jaclyn Hill, Rachel Leary, Jordan Lipscombe & John Maclean - I could go on, I watch so many! You Tube has 100% improved the makeup I do on myself and on others. Makeup wise, I cannot live without Anastasia Beverly Hills Dipbrow & No7 Beautifully Matte Foundation. Both of these products have been in my collection for over 2 years now and I still haven't changed them up! Skincare wise, Micellar water is a life changer!! If you could only use one brand forever, which one would you choose? I think I'd probably have to pick NYX. Obviously all brands have the things they are amazing at making and I think NYX have some of the most amazing products all round, I love their eye shadows, liner, brow products, lipstick, primer, glitter, glitter glue and setting spray! Their foundation is also meant to be amazing. I know you are a huge lover of drugstore makeup, what are the top 3 products you would recommend? Everyone knows I love No7 Beautifully Matte foundation!! But other drugstore products that are a must-have are the collection Glitter Liners, Rimmel instafix + go priming and setting spray and Rimmel Scanaleyes Felt Tip liner. Are there any high end products you think are worth the splurge? The Modern Renaissance Palette from ABH is definitely worth it! You can create a whole look just using that palette, that's why I love it! I honestly don't own that many high end products, mostly because I love finding Drugstore alternatives that work just as well! I bought the collection Glitter liners at the time when everyone was splurging on the MoonDust ones from Urban Decay. Now I wouldn't even bother trying any other Glitter liners because I love the collection ones so much! Do you have any advice for young girls/boys who are just starting to experiment with makeup? Please be as creative and as colourful as you like. You shouldn't feel tied down by any rules, it doesn't matter if no one else is doing it because that's how makeup trends are created. Makeup is supposed to be fun and in my opinion, makeup is a type of art, so PAINT honey! Do you have any makeup tips/hacks you would share? One that I've discovered recently is all to do with bronzer. For some reason, I just couldn't get the hang of bronzing my face. I'd either put far too much on or my foundation would move around, making my face look all muddy. I ending up buying a L'Oréal True Match face powder, but I bought it in a darker shade. As this is a thick, almost foundation like powder, it blends so nicely into the skin and doesn't upset your foundation underneath. Also, if you put too much on, you can just defuse it with your regular face powder. What is your skincare routine? I take off my makeup with micellar water, I usually use a lot of cotton pads whilst doing this, just to make sure everything is off my skin. Then I use the body shop cleansing balm which completely melts off any left over makeup. You can use this product without taking your makeup off first but I just like to be extra careful. I'll then scrub my face with the L'Oréal glow scrub, then I use a face wash, usually my Garnier Naturals one. I'll spritz my face with the Botanics Toning Spray and then pop on some moisturiser, either my L'Oréal hydrogenius one or Garnier Rose day cream. I also like to treat myself to a face mask when required, my favourite is the L'Oréal detox mask. Do you have any tips for Mua's starting out who need to build a kit on a small budget? A big problem for most MUA's is their selection of foundations, so what I did was just buy 4 shades all spread out along the shade range. This allows you to custom mix shades for clients, instead of spending a lot of money on unnecessary product. I also love the body shop Lightening & Darkening foundation drops. What plans do you have for the future? I have heard you mention a masterclass and doing Youtube tutorials on social media? I now have a date for my masterclass which should be revealed in the upcoming weeks - I am so excited! I do want to do YouTube, I'm just nervous to start. I want to make them worth watching and professional so at the moment I'm saving for a new camera and laptop so I can do the best I can! Lastly, how do you deal with negativity from peers or on social media? I think I've just learnt that people will always talk - so give them something to talk about. I'm lucky enough to have such supportive friends and family so whenever any hate occurs, I just think about how much I love what I do and why I should never let people take that away from me. But before I've done that I usually have a good rant on my Snapchat about it! A huge thank you to Maeve for this interview and for doing such a great job of my makeup. I cannot wait for my next night out to get glammed up by you again!